Barack Obama calls it the "Most progressive trade deal in history". The Republican Congress voted last year to give Obama "special power" to fast track it. Ted Cruz also supports it while Trump and Sanders are against it. Barack Obama is secretly negotiating the largest international trade agreement in history, and the mainstream media in the United States is almost completely ignoring it. If this treaty is adopted, it will be the most important step toward a one world economic system that we have ever seen. 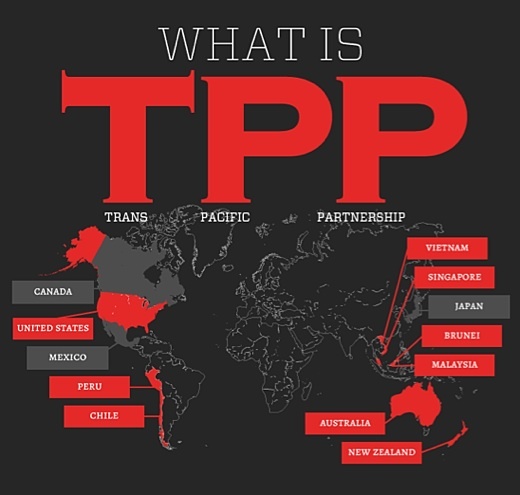 The name of this treaty is "the Trans-Pacific Partnership", and the text of the treaty is so closely guarded that not even members of Congress know what is in it. Right now, there are 12 countries that are part of the negotiations: the United States, Canada, Australia, Brunei, Chile, Japan, Malaysia, Mexico, New Zealand, Peru, Singapore and Vietnam. These nations have a combined population of 792 million people and account for an astounding 40 percent of the global economy. And it is hoped that the EU, China and India will eventually join as well. This is potentially the most dangerous economic treaty of our lifetimes, and yet there is very little political debate about it in this country. Later this month, consumers will flock to retail stores for "Black Friday" deals. But if you look carefully at those products, you will find that almost all of them are made overseas. We buy far, far more from the rest of the world than they buy from us, and that is a recipe for national economic suicide.